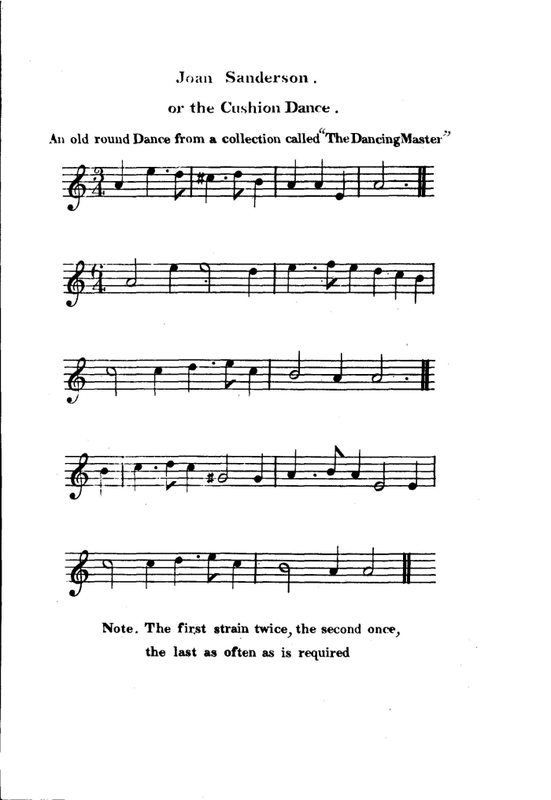 An old Round Dance from a Collection called "Dancing Master." The nickname for this dance is "Kissum." Source: Davies Gilbert, Some Ancient Christmas Carols. London: John Nichols And Son, Second Edition, 1823. This dance is begun by a single person (either man or woman), who, taking a cushion in their hand, dances about the room, and at the end of the tune they stop and sing, "This dance it will no further go." The musicians answer, "I pray you, good Sir, why say you so?" — Man. "Because Joan Sanderson will not come too." — Musicians. "She must come too, and she shall come too, and she must come whether she will or no." — Then he lays down the cushion before the women, on which she kneels, and he kisses her, singing, "Welcome, Joan Sanderson, welcome, welcome." Then she rises, takes up the cushion, and both dance singing, "Princum Prankum is a fine dance, and shall we go dance it once again, and once again, and shall we go dance it once again." Then making a stop, the woman sings as before, "This dance will no further go." — Musicians. "I pray you, good madam, why say you so?" — Woman. "Because John Sanderson will not come too." — Musicians. "He must come too, and he shall come too, and he must come whether he will or no." And so she lays down the cushion before a man, who kneeling upon it, salutes her; she singing, "Welcome, John Sanderson, welcome, welcome." Then he takes up the cushion, they take hands, and dance round the room singing as before. And thus they do, till the whole company are taken into the ring; and if there is company enough, make a little ring in its middle, and within that ring, set a chair, and lay the cushion in it, and the first man set in it. Then the cushion is laid before the first man, the woman singing, "This dance it will no further go;" and as before only instead of "Come too," they sing, "Go fro;" and instead of "Welcome, John Sanderson," they sing, "Farewell, John Sanderson, farewell, farewell;" and so they go out one by one as they came in. Note. — The women are kissed by all the men in the ring at their coming and going out, and likewise the men by all the women. "The Court of England is much altered. At a solemn dancing, first you have the grave measures, then the corrontos and the galliards, and this is kept up with the ceremony; at length to French-more (it should be trench-more,) and the cushion dance, and then all the company dance; lord and groom, lady and kitchen-maid, no distinction. So in our Court in Queen Elizabeth's time, gravity and state were kept up. In King James's time things were pretty well; but in King Charles's time, there has been nothing but French-more and the cushion-dance." Sheet Music from John Playford, The Dancing Master. 10th Edition (1698), p. 7. 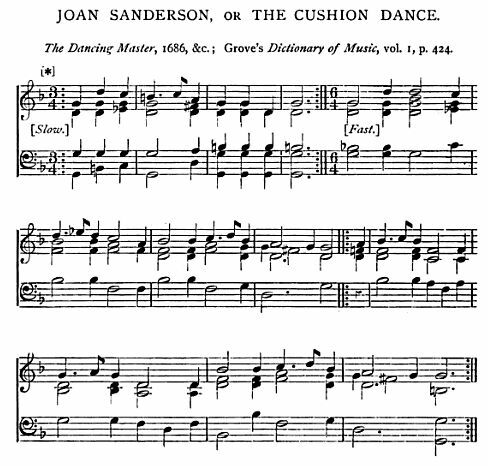 Sheet Music: "Joan Sanderson, or The Cushion Dance" from Chappell, Old English Popular Songs, Vol. 1, p. 287. 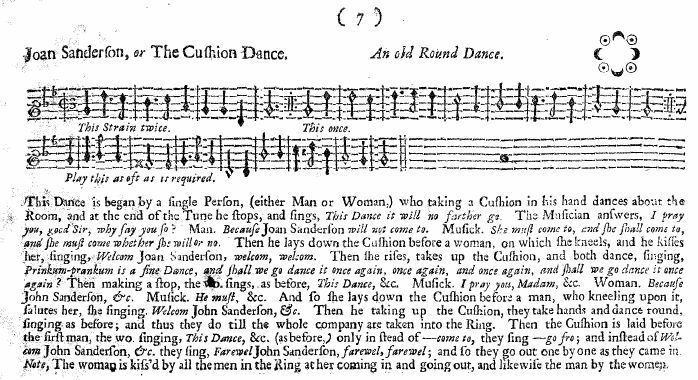 The Cushion Dance is one of two dances referred to in the Christmas ballad Shropshire Wakes, or "Hey For Christmas."